Our Favorite Summer E-design Projects — JJones Design Co. It is hard to believe it is September already! Summer has come and gone so fast before I realize it. However, I want to share with all of you some of my favorite e-design projects that I have worked on with my clients via both private and Decorist this recent summer. I worked with a client that is building their new house in Central Oregon. The client wanted to have an unique master bath design that reflects their style and appreciate the natural of Central Oregon and beautiful view of the cascades. 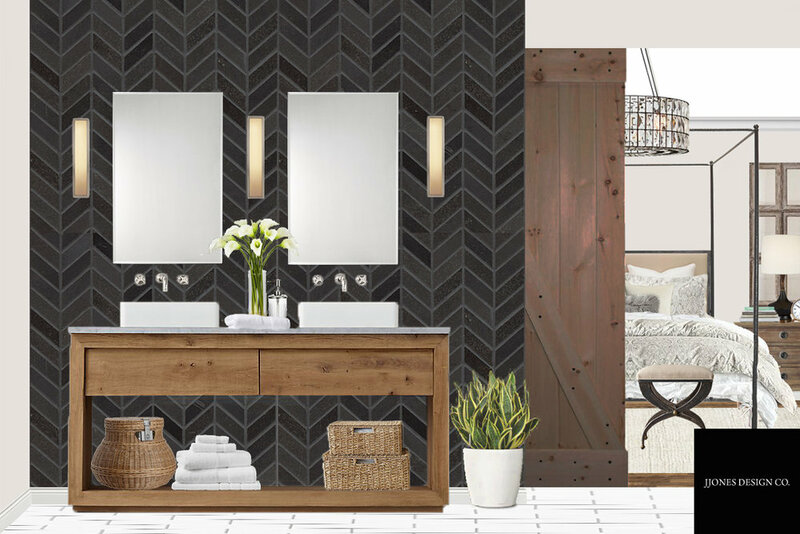 I chose black chevron tiles for walls to make bold statement and create an upscale look. It also works great with natural materials including rustic wood vanity furniture, rustic barn door, and sloped ceiling. It is something you wouldn't expect to see when you walk into the master bath which is exact what the client wanted for their new house. I have to admit this is one of my all the time favorite e-design projects that I have worked so far. Same client I worked with on their master bath e-design project - we also worked together on their rustic glam style master bedroom. The client wanted their master bedroom to feel like they're on vacation at some luxury lodge home with some glam touches. I selected the canopy bed with both glam mirrors on both side to give this master bedroom an upscale look. More important it has to be comfortable for the client so they can escape the reality to relax and feel like they're on vacation even it is right at their home. I love how this design flows from rustic glam style master bedroom into modern industrial style master bath without being completely out of the place. Both styles work together just perfect! 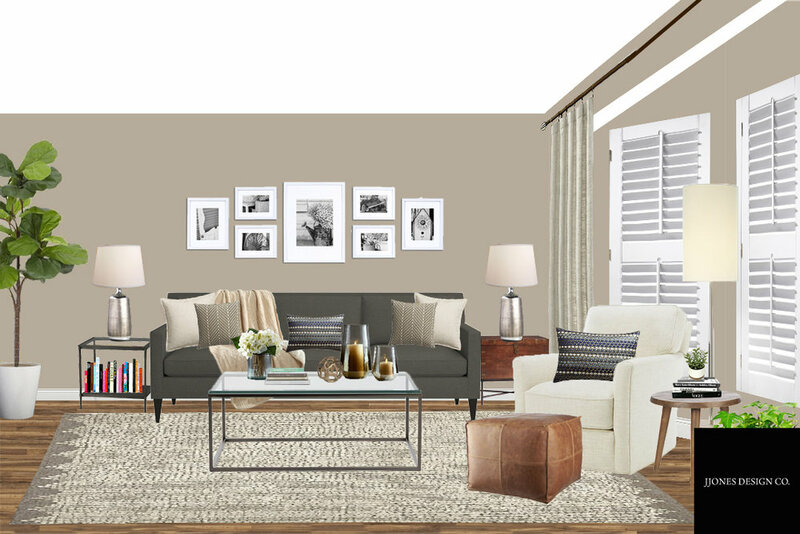 I worked with this client that recently purchased the house in Chicago suburbs and wanted to have a nice modern farmhouse style family room that would spend alone time with their partner without kids. They would enjoy to have an adult conversation, read the book or watch television. They struggled with the unique family room layout since it has two doorways and bay windows. I helped them to solve the furniture layout challenge and improve the room flows without having furniture getting in the way between two doorways. This client purchased the house in Los Angeles suburbs and did massive remodel project to update their house look from early 90's style to present day. They wanted to have stylish living room with natural materials that would wow their guests when they enter their house. Only challenge part of this proejct to work around the layout due to step down from the foyer area, stairs, playroom next to this space and a doorway to the kitchen. I had to make sure new furniture won't get in the way and completely out of place to improve the room flow. It was fun working on this project due to unique style that would work with darker grey walls. This is one of my all the time favorite living room e-design projects I worked on so far. Same client I worked with on their modern bohemian style living room - we also work together on their powder room project. The client wanted to have farmhouse style but happen to be kid-friendly powder room. They recently remodeled their kitchen that already have subway tiles backsplash and I suggested to the client that subway tiles would work perfect for their powder room too by having two subway tiles walls which is shown on the board above. It would help them to save money on this project since they already have some extra subway tiles left from their kitchen remodel. We selected this vintage style sink that would have two faucet to create an authentic farmhouse style plus make it more kid-friendly for their children. We are happy with the way this powder room e-design project turned out. One of my favorite bathroom e-design projects. 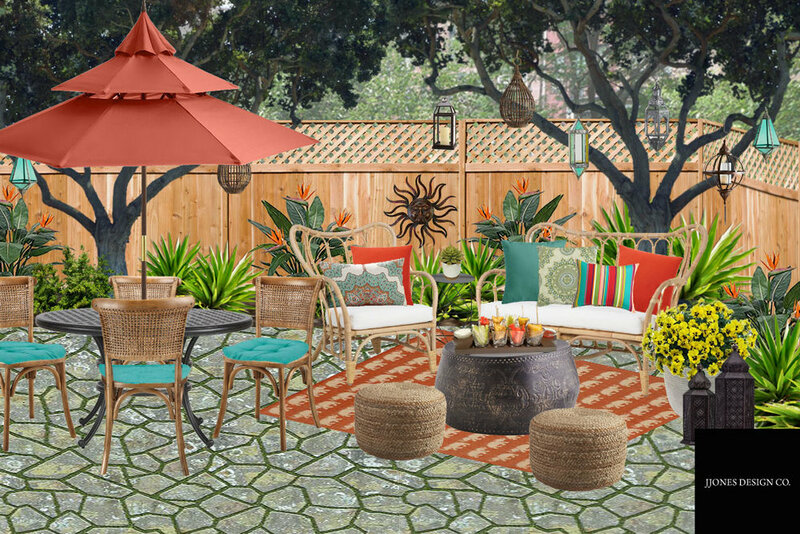 I mentioned about this e-design backyard project on my other blog, Sippin' Lemonade in the Summertime This client recently purchased a home in Bay Area and wanted to have a Bohemian style backyard that would include numerous lanterns hanging from the trees with fun colors around the patio furniture. We managed to put the design together to meet the client's dream and would fit in their budget. Love it when our clients want us to design something so different and unique for their space. This is one of my all the time outdoor living space e-design projects. So now fall is here, I have some incoming e-design projects to work on. I will discuss about some of e-design projects that I am working on once this fall season is over.